Next post: Flight attendant – still a hot job to date! If you read my post below, you already know I get a lot of traffic from people looking for an Emirates flight attendant. Unfortunately you’re not going to find one here. What you will find are posts about my life as a flight attendant for a US carrier. Still looking for that Emirates flight attendant? Fine. Whatever. After doing a little research, I found one. 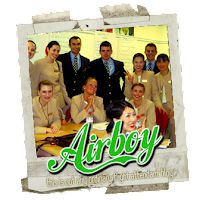 Not only did I find one, I found a cute one, and he has created a blog, Airboy, chronicling his new life as a flight attendant for Emirates. Tell me this guy isn’t cute! You can thank me later. Hey !!! Thanks for the plug. didn’t expect that much !! Will of course do the same on my side. Keep posting, I’m always looking for some reads as I’m on standby for the next 2 weeks !